This well illustrated history of Childwickbury (pronounced Chillickbury) from medieval times to the present day, is about the owners and the community who lived and worked there. In medieval times the Manor of Childwick belonged to the Abbot and monks of St Albans and at the Dissolution in 1540 this manor came to the crown. 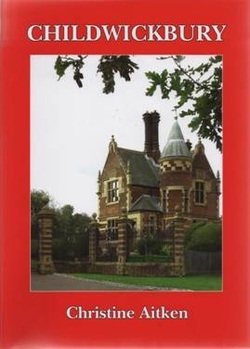 Various families owned the estate down the centuries and this book extensively covers the histories of these families - the Lomax’s, Toulmin's, Maple’s and the Joel’s. There are also chapters on the Childwickbury community in the 19th and 20th century; the Church of St Mary (in St Michaels Parish); the world famous Childwick Stud; the Childwick Green School; the Hawkswick Estate; the ‘One Bell’ public house and estate ‘Club’; Sir George Clausen RA as well as the stories of the young men of the estate who lost their lives in both World Wars. In 1978 estate land and most of the estate houses were sold. Childwickbury Mansion and parkland was bought by the film producer Stanley Kubrick. H J ‘Jim’ Joel retained the world renowned Childwick Stud and continued living at Childwick Hall until his death in March 1992. ﻿The Childwickbury Stud was bought in early 1993 by a company headed by the Marquesa de Moratalla and remained as a Stud until the Autumn of 2011 when it was sold to Mr & Mrs Paul Flatt. After extensive refurbishment, The Childwickbury Stud re-opened in early 2015 thus securing a future for these famous paddocks and stud buildings. The book also includes 1854, 1906 & 1978 Estate Sale particulars, Census analysis 1851 to 1901, names of most of the families who lived and worked on the estate from 1850 - 1973 and details of the Wills of John Blundell Maple, 'Jack' Barnato Joel and Harry Joel 'Jim' Joel.